Conservatives yesterday hailed the Trump administration's Clean Power Plan replacement as a return to federalism, but some warned the fight to eviscerate the endangerment finding is still a hot topic. EPA's 2009 ruling that greenhouse gases pose a threat to public health is the legal basis for climate rules under the Clean Air Act. It's what forced the agency to issue a new proposal — the Affordable Clean Energy (ACE) rule — yesterday rather than repeal its greenhouse gas regulations altogether, and acting EPA Administrator Andrew Wheeler has said the issue is settled law (Greenwire, Aug. 21). "Just to be clear, this is a regulation of greenhouse gases," EPA air chief Bill Wehrum said of ACE yesterday. "No doubt about it." 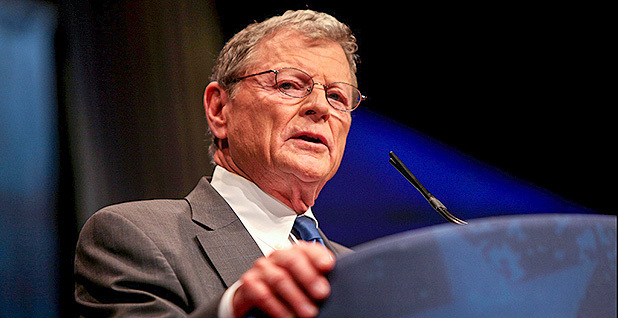 But while the administration would have to navigate a legal labyrinth to repeal the endangerment finding, "the issue is still alive," Sen. Jim Inhofe (R-Okla.) said yesterday. It'll have to take more time, though, because any repeal of the finding would likely result in "a bunch of lawsuits," Inhofe added. "I think we'll eventually see changes there, but that hasn't happened yet," he said. Myron Ebell, who led President Trump's EPA transition team and is now with the Competitive Enterprise Institute, took a similar line. ACE would set guidelines for states to curb emissions by strictly focusing on efficiency improvements, a proposal that Ebell said would provide "minimal regulation of greenhouse gas emissions from existing power plants." But that doesn't mean CEI will drop efforts to get the endangerment finding repealed, he said. "It remains to be seen whether the Supreme Court will find that the replacement rule satisfies the requirements of the 2009 endangerment finding," Ebell said in a statement. "CEI's petition to re-open and reconsider the finding is still before the EPA," he said. "We think that granting the petition remains the best option if the court decides that the new rule doesn't do enough to reduce carbon dioxide emissions from coal and natural gas power plants." Still, Trump's replacement plan is generally popular among Republicans so far, though most offered only initial impressions or said they hadn't read up on the details. Senate Energy and Natural Resources Chairwoman Lisa Murkowski (R-Alaska) said she was waiting to learn how the Trump administration's proposal would affect her home state, which was exempted from the Clean Power Plan. She didn't know whether Alaska would have to submit a plan to curb emissions but noted that Alaska Gov. Bill Walker (I) has convened a climate task force to pursue clean energy goals. The rule would mark a significant departure from the Obama administration's Clean Power Plan, which took a systemwide approach to cutting greenhouse gases. States would have three years to draft plans under guidelines for slashing greenhouse gas emissions from EPA, though the proposal does not include a minimum requirement for carbon emission reductions. The approach would mirror how EPA currently regulates other pollutants, like ground-level ozone and fine particulate matter. EPA's own analysis suggests that although the blow would be softer on coal, the industry would still slip in the coming decades, with production falling 41 percent by 2035 (E&E News PM, Aug. 21). But proponents of the plan, including North Dakota Democratic Sen. Heidi Heitkamp, prefer the "inside the fence line" approach, which aims to reduce emissions at individual power plants rather than regulating the grid as a whole. Senate Environment and Public Works Chairman John Barrasso (R-Wyo.) suggested that coal-reliant areas in his home state, such as the city of Gillette, are primed for the biggest benefits. "I was in Gillette over the weekend, and people were very much looking forward to the changes that are coming," he said. 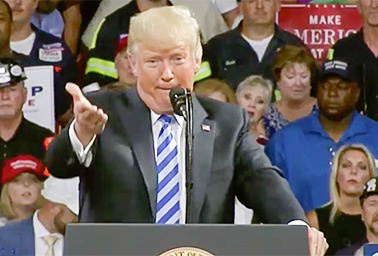 Similarly, Trump last night declared during a rally in West Virginia, "We are putting our great coal miners back to work." Democrats, meanwhile, may take a few pages out of the Republican playbook to fight EPA's proposal. That could include an attempt to use the Congressional Review Act — which Republicans have used to repeal 14 Obama-era regulations — to undo the rule (E&E News PM, Aug. 21). But the courts will likely provide a more practical avenue of opposition, and Senate Democrats predicted yesterday that ACE would become the latest EPA regulatory proposal to get held up by the judiciary. Republican critics of the Obama administration waged a war against the CPP in the courts, and they prevented it from taking effect. "What the Trump administration is doing will not hold legal standing, so we're going to have to use the courts," Sen. Ben Cardin (D-Md.) said yesterday. 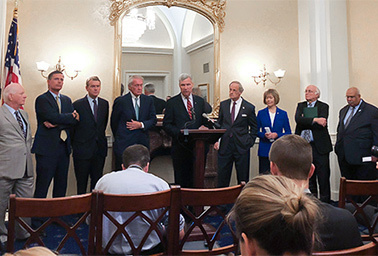 Sen. Sheldon Whitehouse (D-R.I.) added that court losses have been a "recurring phenomenon" under Wheeler and former Administrator Scott Pruitt. "This rule is probably a 90-plus percent Pruitt EPA rule, and what we have seen is when that corruption and those conflicts of interest are exposed to courts, they lose and they lose and they lose," Whitehouse said. "And we predict a similar fate for this phony rule." Sen. Brian Schatz (D-Hawaii) suggested that at the very least, EPA is making an attempt to abide by the endangerment finding, as well as court precedent under the Clean Air Act. "My sense is that because they keep losing in court, they've now got some smart lawyers trying to figure out how to actually comply with the law," he said. "We don't think they've gotten there yet, but I think Pruitt's legacy in addition to corruption and a kind of free-wheeling atmosphere on behalf of polluters is a bunch of court losses."